With a growing number of schools offering interdisciplinary STEM programs, sometimes in partnership with industry, there many case studies available that show how such programs can be highly beneficial to students and teachers alike as they introduce critical thinking skills into the classroom. However, integrating STEM skills as an everyday practice requires new modes of preparation and perseverance by teachers so it is likely that schools will need to take time to find the best model that meets their particular needs. Fortunately, there are professional development opportunities available to assist teachers to create schools based STEM programs and resources available to provide program ideas. The best way to find out about upcoming training opportunities and some of the recent STEM programs underway in NSW is via the NSW Department of Education’s STEM website. Here you will find best practice examples of integrated STEM learning and design thinking approaches that have been successfully used in the classroom. Discover the kinds of topics and activities that can be included in STEM programs and see how they can help prepare students for the future workplace in terms of both technical and communication skills. There are also examples of how flexible learning spaces can help students better collaborate and communicate their ideas, building critical interpersonal skills. Creativity, diversity and continual improvement of programs. A number of STEM programs in the Hunter region have been developed in partnership with industry, bringing a layer of real world relevance for young people. In particular, a new Board of Studies endorsed course called iSTEM has been developed by the ME program at RDA Hunter. iSTEM is now ready for statewide roll out and it is anticipated that more than 130 schools will adopt the program in 2017. Standing for integrated Science, Technology, Engineering and Mathematics, the iSTEM course includes modules in aerospace, robotics, engineering, aerodynamics, motion, bioengineering,and3D Design. Developed in partnership with Maitland Grossmann High School, the iSTEM course has also received input from some of the Hunter’s most innovative companies who also provide work experience as part of the program. 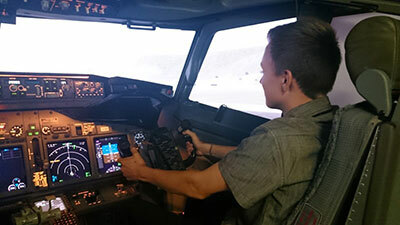 For example, iSTEM students recently participated in the first Wedgetail In-Service Support (WISS) Work Experience trial at Boeing Defence’s Williamtown facility. Year 10 iSTEM students from Maitland Grossman, Hunter River and St Paul’s High Schools enjoyed a week of activities, interviews and excursions designed to introduce them to the ‘World of Work’ whilst gaining exposure to Boeing experts in the areas of engineering, logistics, training, maintenance and operations. The students enjoyed early morning flights in the Wedgetail simulator, tours around the aircraft and labs, and visit to the F/A-18 Deeper Maintenance Hangar. These were combined with briefs from various WISS Team members who shared their stories, career options and pathways taken to get where they are today. The experience not only highlighted the importance of STEM skills required for Boeing jobs of the future, but also demonstrated the criticality of core non-technical skills like team-work, communication and problem-solving. Watch the iSTEM ME Program video. There are huge benefits in bringing real science, mathematics and computer science into the classroom through partnerships between teachers, scientists, mathematicians and industry professionals and we can expect to see more of these education-industry collaborations in the future. Ultimately, integrated STEM programs create a positive perception of STEM careers and greater student awareness about future employment possibilities. They can also be fun, offering creative approaches to learning via hackathons, competitions and hands on experiences. Australia’s Chief Scientist has developed a STEM Program Index that lists more than 250 active programs. Among them are STEM initiatives provided by businesses, universities, science and education agencies and government departments including CSIRO’s national Scientists and Mathematicians in Schools program. Download the STEM Program Index. The Australian Government offers a range of support to assist student participation in STEM competitions and programs with up to $20k available. Visit the AusIndustry website to find out more. RDA Hunter will be hosting a Smart Workforce STEM conference in Newcastle on 12 May 2017 that will bring together representatives from secondary and tertiary education institutions, industry and key players in the STEM fields. It aims to build stronger partnerships between STEM employers and education institutions in order to improve students STEM capabilities. Registrations will open January 30th. Jackie Randles is the Manager Inspiring Australia NSW.